Since July 1, 2012, Muni has been operating with the all-door boarding policy. It's pretty nice that I don't have to wait in a long line for the front door by simply boarding the rear door and tagging my Clipper card. If you are familiar with Muni Metro, all-door boarding has been going on with the light rail system for much longer ever since they brought in the grey Breda cars. When the metro arrives at a surface stop and doesn't open the doors, you reach for the button on the left or right side that is illuminated to open the doors. When the operators of the buses stop to pickup/discharge passengers, it's a luck of the draw if the operator will open the rear doors for you, a passenger exits the bus, or the rear door entry button works. On the Muni buses, for the exception of the oldest ones in the fleet, all the rear doors have buttons on the exterior, one on the left and another on the right of the doors (see photo on this blog entry). But having that button lit and available for use has been quite inconsistent since the agency allowed all-door boarding. I've been riding Muni more frequently on the weekends and I ride a variety of vehicles to get to where I want to go. I'd say about 30 to 50% of the time, the button does work to open the doors, but there are moments when the button doesn't respond and I have to hurry to the front door just to board the bus. In one instance, the bus drove off because the button failed to work. 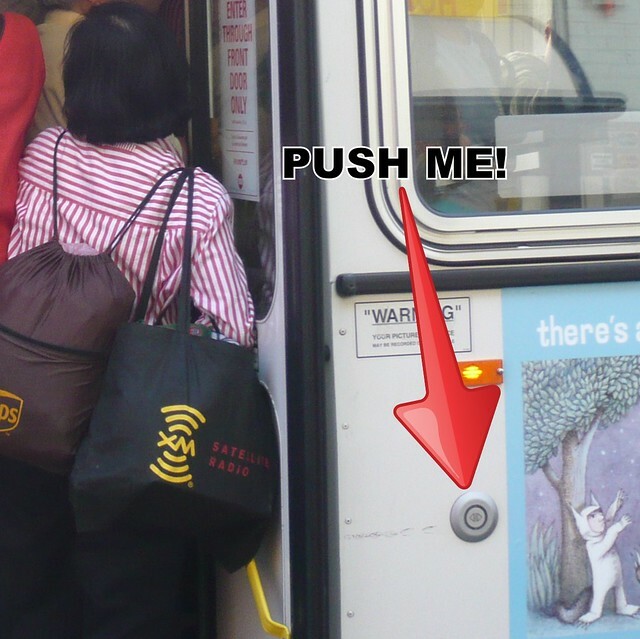 I feel Muni needs to make an effort to check all their buses to make sure the rear door entry button can light up and work properly. They ordered their buses to intentionally have those buttons, and for just over six months, not all the vehicles allow entry due to the failure of the button. This is a project Muni needs to work on. If they gain the trust of their passengers to be allowed to enter the door with reliable working equipment (the buttons), more will board the rear to allow a more efficient transit agency. All the metro trains have their door buttons work perfectly every time, now it's time to make sure they work on the rest of the fleet.